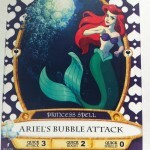 Warning: This post will contain spoilers of the new interactive game, “Sorcerers of the Magic Kingdom”. 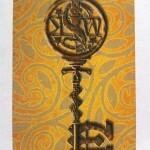 If you wish to experience the game from a clean slate of knowledge, do not continue reading. Earlier this month, Disney opened Sorcerers of the Magic Kingdom to limited guest testing. This past Sunday, I had my first opportunity to begin playing the game. The game’s checkin center is at the Firehouse on Main St, to the right of Guest Relations. There was an A-Frame out in front, saying that they were “recruiting” new Sorcerers. Even with this notification, however, there seemed to be very few people at the Firehouse, only about 3 people ahead of me in line when I went to check in. While waiting to check in, we see a video explaining the story of the game. Basically, Hades has decided to take over the Magic Kingdom, using something called the Crystal of the Magic Kingdom, which has been broken into several pieces, scattered throughout the lands. Hades, being the god of the dead, has the ability to resurrect different Disney villains who met their end. (Side note: this was also the plot of an episode of Hercules: The Animated Series, which crossed over with the Aladdin series as Hades resurrected Jafar. I wonder if the Imagineers knew that when conceiving the story). Merlin, King Arthur’s trusted wizard from The Sword in the Stone, is attempting to stop Hades, and he’s recruited us guests to help him. When I got to the podium to check in, I was given a small key card , smaller than the size of a playing card, and as thin as a piece of paper. 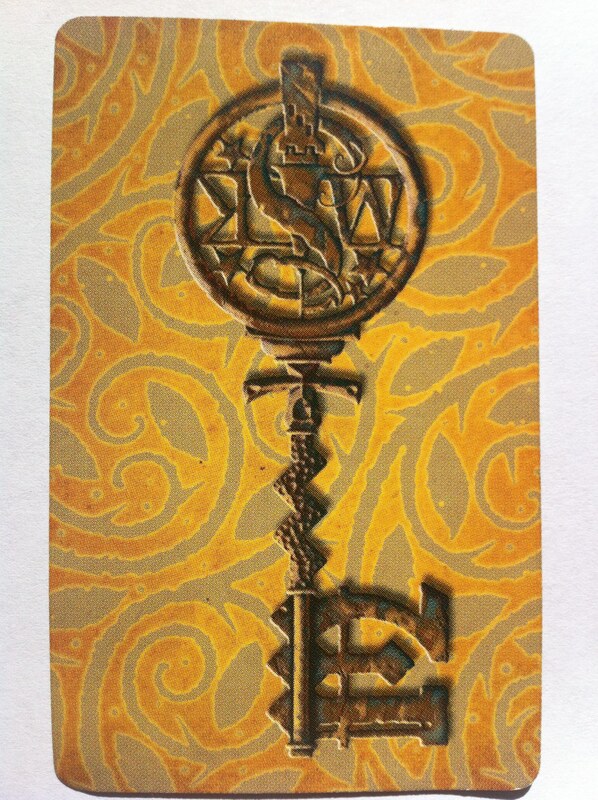 This card has RFID technology inside it (similar to hotel room keys or office workers’ badges that let you in the door), that we would use to activate each “portal” throughout the game. I was also given a collection of 5 spell cards, and a map of all the portal locations. 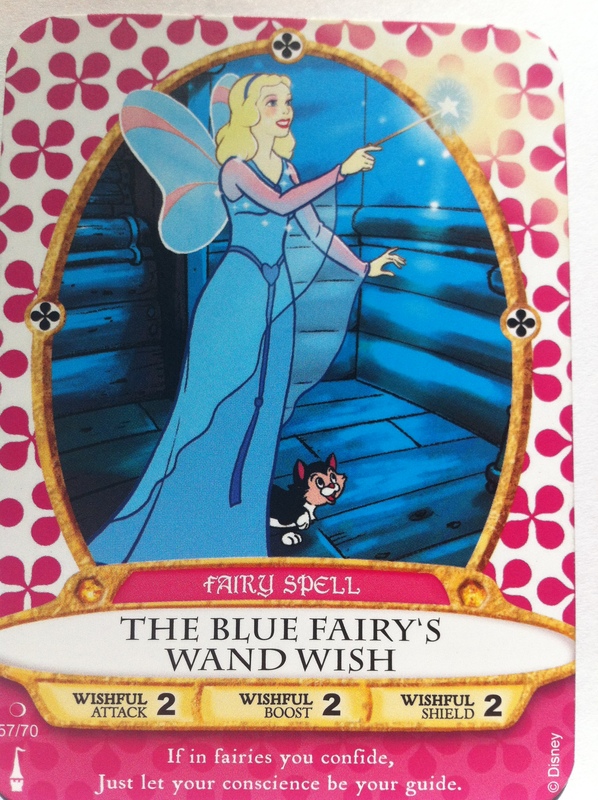 Each spell card is about the size of a playing card. 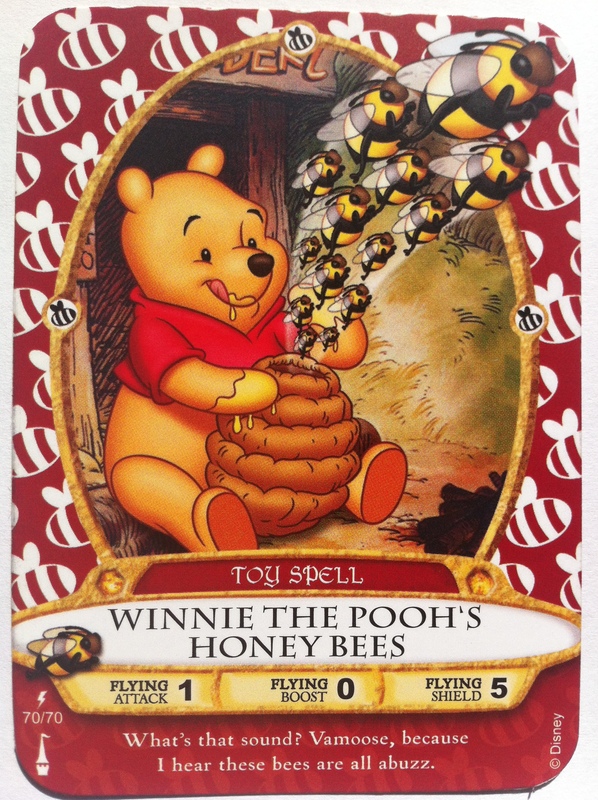 They each have a different Disney character, the name of a spell, and the powers of that spell in three categories (attack, shield, and boost). 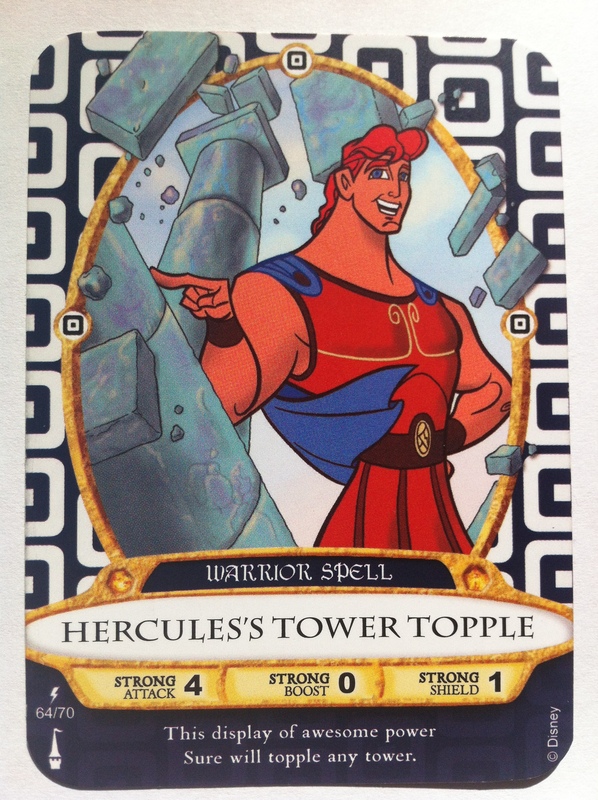 These are the cards that we’d use to defeat the villains Hades has recruited. 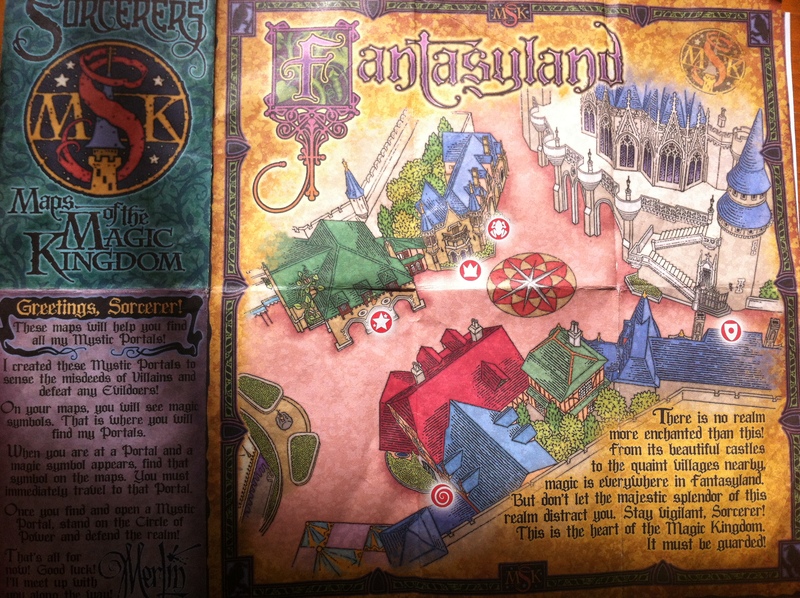 After a quick demonstration in which the Cast Member showed me how to use the key card and spell cards, Merlin sent me to my first location, by showing a picture of it and a symbol corresponding to the symbols found on the map. 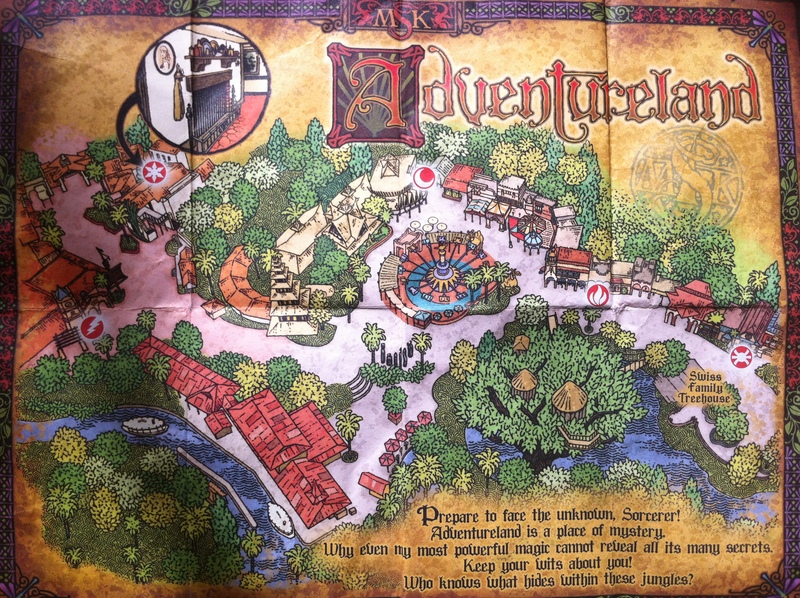 I was off to Adventureland. When I arrived at the first portal, Merlin explained that Hades had first recruited Jafar, who you may recall was turned into a Genie at the end of Aladdin, and killed at the end of Return of Jafar. After setting up the backstory, Merlin said that he was under attack himself, so he sent a magical friend to help me, that being the Genie himself. The Genie sent me to the next portal, where I did my first “battle”. At the next portal, I had to defeat Jafar’s plan by casting a spell at him. 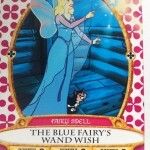 To do this, you take one of your spell cards and hold it up, facing the portal, while standing on the “Circle of Power”. 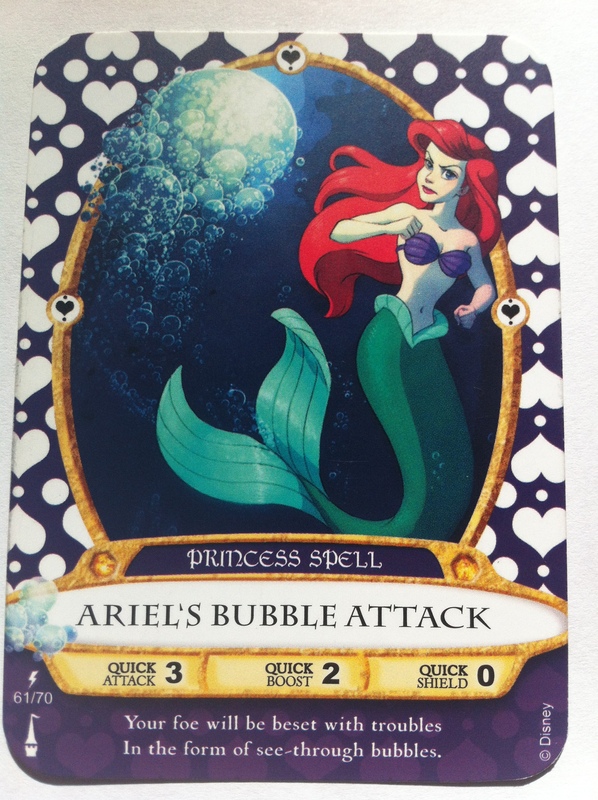 Once the portal recognizes the card, the spell activates, and you see the damage your spell causes to the villain. Each spell effect is specific to the card you use. 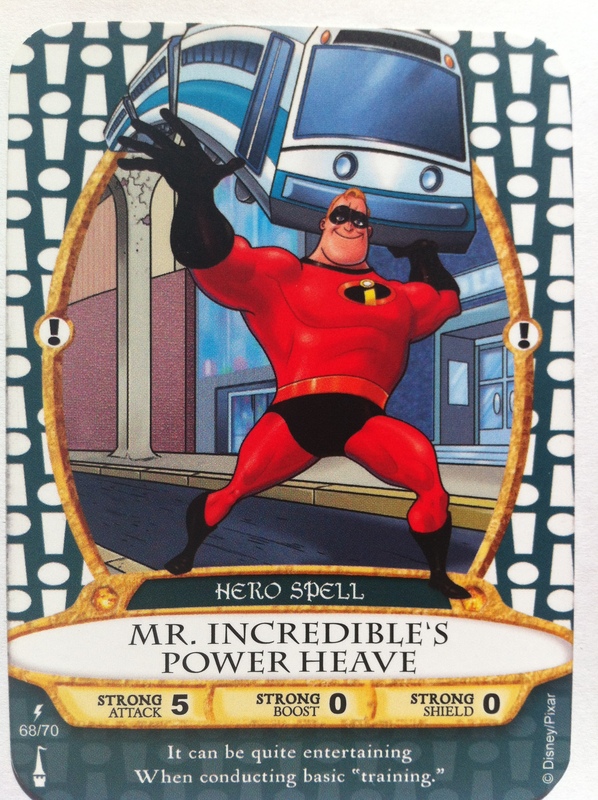 For example, when I used Mr. Incredible’s Power Heave, you actually see a train that Mr. 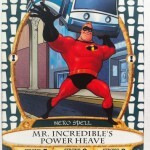 Incredible has tossed, fly onto the screen and cause the destruction. At that point, Genie came back to congratulate me, and sent me to the next portal. This sort of pattern repeated itself 3 or 4 times – go to a portal, see the villain (or henchman) doing something nasty, use a spell card to defeat him. Once per round, instead of casting a spell of your choosing, Merlin or his assistant tells you to use “The Sorcerer’s Crest”, which basically means the back of the spell card. After 4 or 5 portals, you are able to defeat the villain. Merlin congratulates you, but then points out that Hades is still recruiting other villains, and could still use your help. The portal shows that your game is over, but if you’d like to continue, shows another portal to go to. 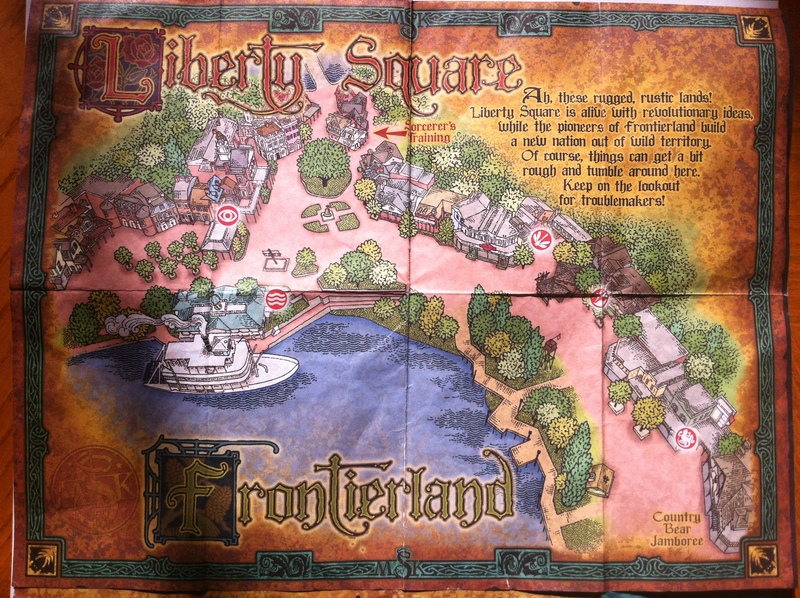 On that Sunday, I did three rounds, one in each of Adventureland (battling Jafar), Liberty Square/Frontierland (battling Radcliffe from Pocahontas), and Main St USA (battling Cruella DeVil). At that point, time constraints forced me to leave the Magic Kingdom for the day. However, I returned on Tuesday, and checked in to the firehouse again. This time, the CM needed to swipe my admission ticket before giving me any cards (not surprisingly, it turns out people were coming back into line time and time again trying to collect as many cards as possible). I’ve heard from friends that during the testing phase, each guest will be allowed one set of cards per day, and when it opens, they’ll increase it to 3 per day. So I got a new keycard, and 5 new spell cards (no duplicates). I put the new keycard away, and used the keycard from Sunday instead, and returned to the next portal in my aborted game. 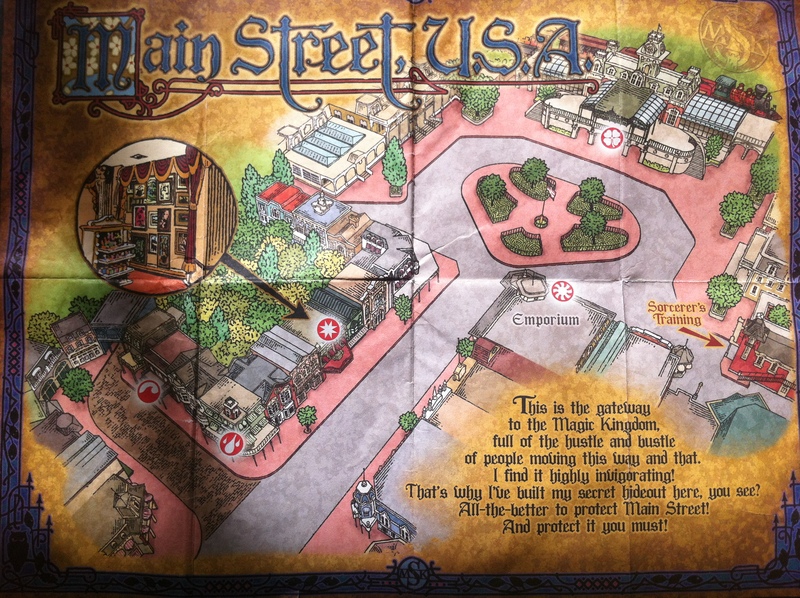 It sent me back to Liberty Square, where I faced Dr. Facillier from Princess and the Frog, then to Adventureland to defeat Scar, then stayed in Adventureland to defeat Yzma from Emperor’s New Groove. After finally defeating Yzma, Merlin told me that even though I defeated her, she still managed to get her piece of the Crystal of the Magic Kingdom to Hades, and that meant that I now had to face Hades himself. 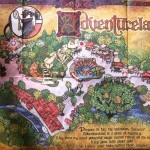 To do that, I now had to go to Fantasyland. In Fantasyland, it seemed as though only two portals were working, or at least, the game was configured to only send me to two portals, back and forth repeatedly. This is also where I encountered the only problems I had with the game – two different times, the portal didn’t recognize that I was holding a card, and actually told me “too late! Hades has won!!”. At first I thought I was going to have to restart the game from scratch, but instead it just sent me to the next portal to repeat that segment. 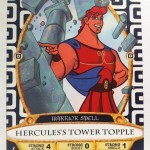 Finally, I defeated Hades, saved the Magic Kingdom, and was was granted the title of “Master Sorcerer” by Merlin. Overall, I think I spent about 3 hours total on the game between Sunday and Tuesday. That makes it significantly more involved than the Kim Possible adventure over in Epcot. 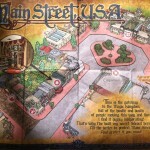 I wonder how many families actually vacationing in WDW are going to be okay with taking 3 hours out of their trip to play this game, rather than, you know, riding rides. Also, right now the game is still in testing. I talked with a CM Sunday before leaving and found out that this is not yet the finished product. For one, right now when a villain attacks you, basically nothing happens. Eventually, you might actually lose the game due to the villains’ attacks. Also the game is preset on Easy mode during testing. When it goes live, guests will be able to choose Medium or Hard. In those levels, the powers and effects of each individual spell will actually matter. Some villains will be susceptible to some spells and not others, and you may have to cast more than one spell to defeat each segment. I think the game will be much more interesting at that point, as it got pretty tedious after a while (walk to portal, swipe key card, hold up spell card, go to next portal, repeat). As I said, twice the portal didn’t recognize that I was holding a card out. This obviously needs to be fixed. Some of the portals, not many, are in areas where guests would like to walk through. More than once, while I was playing a guest would pass right between me and the portal. I don’t think they were being rude, there just wasn’t any obvious reason for them *not* to walk there, because unless you’re looking right at it, it doesn’t look like anything special. They may need to reconfigure the walking paths on some of these. One of the portals in Fantasyland had audio problems. The main portion was fine, but at the end when Merlin tells me to go to the next portal, it was difficult to hear him. I don’t think 5 cards is enough for one full game. It’s enough for one “land”, or round, because there are only 4 or 5 portals per round. But to actually go all the way through and defeat Hades, it’s very repetitive to keep using the same cards over and over again. I worry about overcrowding. Throughout both days, it was rare that I’d arrive to a portal and it’d be empty. Usually I had to wait for at least one group to complete their battle before I could step up. And this is only in testing – when it goes live and more people start playing it, I worry about a lot of backup. I think the spell effects could use a little work. Basically you see the villain doing his thing, and then you cast a spell. The spell effect look likes it happens “in front” of the villain, as though there were two different screens one in front of the other. It doesn’t look quite right, as though the effect isn’t actually interacting with the villain. 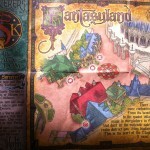 As noted above, only two of the portals in Fantasyland seemed to be activated, although there are 5 listed on the map. Also, there aren’t any in Tomorrowland. 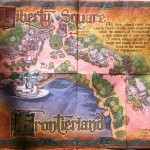 I hope that both Tomorrowland as well as the new portions of Fantasyland get their own portals when the game goes live. The vast majority of the portals are in out-0f-the-way areas, around corners or in little nooks. Most guests would never have a reason to approach them. There are a couple of exceptions as noted above. With the three different difficulty levels that will be there when it goes live, I think this is going to be something fun for every age group. The kids can play on Easy and basically never lose, whereas teens and adults will be able to use strategy and feel actual accomplishment if they win. Disney has added a new thing, and isn’t charging for it!!! If nothing else, each of the portals give us some new Disney animation to enjoy. Characters we haven’t seen in animated format since their movies came out, many years ago, are back and acting like their old selves. I think there’s going to be a secondary effect of a new trading opportunity arising, similar to pin trading and vinylmation trading. The spell cards seem to indicate that there are 70 different cards, and the ones you get each time are apparently random. 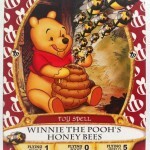 That means some people will get duplicates, and some people will be looking for certain cards. It won’t surprise me at all to see guests trading with each other, and possibly with CMs as well. I like the idea of Merlin battling Hades’s recruitment of villains by himself recruiting characters that have “magic” of their own. Genie from Aladdin, Mama Odie from Princess and the Frog, Rafiki from Lion King, etc. I really like that you can stop playing the game, and come back at a later date to resume playing from where you left off. Overall, I am very happy with the game, and thrilled that I got a chance to play it during this testing phase. I can’t wait to see what changes or improvements are made as the game gets closer to going live (which a CM told me should be around the end of February). Great write up. excellent synopsis. i liked how you bullet pointed pros and cons.